Elvis sings “home is where the heart is” and we may be Barcelona born but formed by twenty nationalities and set in twelve cities, our home is everywhere. This along with our chart addiction made us wonder which cities everyone is singing about and how we could measure it. We have the curiosity, the tools and now an Instagram account to share our findings. Just as birds alter their tune or pitch depending on where they are in the world, we humans reflect our feelings through our own form of birdsong – music. From Cumbia to Isicathamiya, musical genres are as diverse as the cities we inhabit. Whilst we could launch a sociological study on location diversity in relation to music, we’ve been too busy trying to understand the selfie-stick phenomenon. Plus having previously delved into melodies – we decided to focus on the lyrics. More precisely, within song titles, which locations are mentioned the most in the 80 million works in our catalogue. Our Sporcle quiz experience in Naming top 100 popular cities was not sufficient and we needed a good list in as many languages as the titles our catalogue contains. We found all the information we needed in Geonames.org, including all the feasible alternative names of every city, from colloquial names -The Big Apple, New York- and short names -Mexico for Mexico City- to historical names -Bombay, Mumbai- and most importantly, each name’s translation in 639 languages. 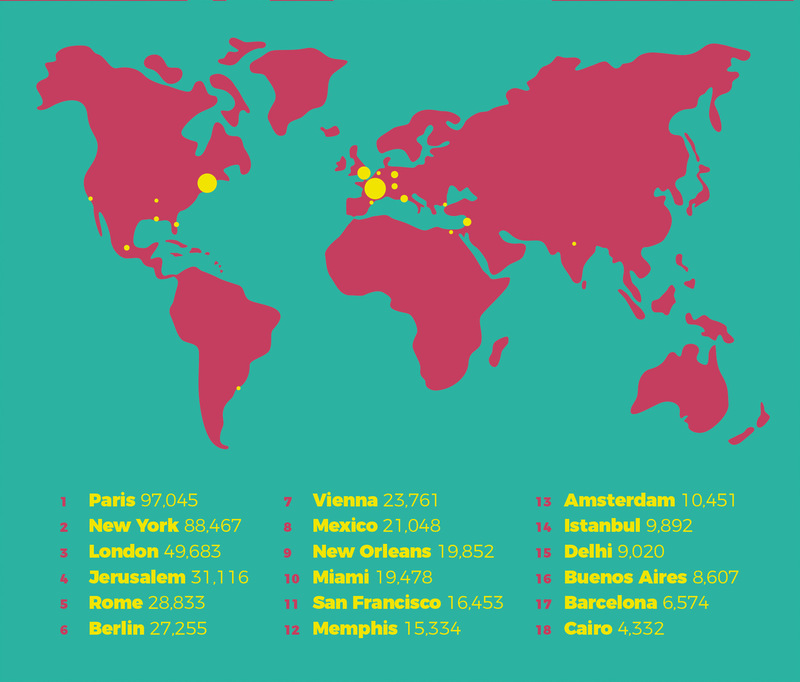 We narrowed the search to the cities with populations over 100,000. We obtained 95,000 results and after a few hours of computation, we matched with the titles stored in our database. The biggest contenders were not surprising. Paris was one of 97,045 song titles -from Josephine Baker’s classic to the contemporary Lykke Li– and New York one of 88,467. Other cities like Buenos Aires -8,607- or Delhi -9,020- took us to sounds typically connected to their regions, like Carlos Gardel’s Buenos Aires Querido or Sunya Beat’s Delhi Slide. Cities like Jerusalem, Mexico, London or Cairo reflected their cultural impact and appeared in an eclectic selection of titles and styles. Some of the results were more curious. Interestingly the search for Istanbul included the many varying historical alternatives. Its current name generated 9,892 hits, whilst Constantinople and Byzantium are mentioned in titles 639 and 280 times respectively. This lead us to find some heterogeneous examples: Trentemoller’s Constantinople, Afterlife’s Byzantium or Tom Waits’ Telephone Call from Istanbul – amongst many others. Acknowledging our very own BMAT melting pot – the search included 639 languages with their alphabets. So in case you were wondering… Paris features in 100 song titles in Cyrillic – Париж – New York is written in Japanese in 64 song titles ニューヨーク and Barcelona in Hebrew in 36 titles ברצלונה. Similarly, colloquial names like The Big Easy -New Orleans- or The Big Apple -New York- had a significant impact on the ranking and totalled 838 and 1,315 hits respectively. Other popular nicknames like Ville-Lumière -Paris- only had 16 mentions though, whilst the well-known Paradise -which actually has 46 identified locations– achieved 60,533 hits. With 80 million titles we considered this to be a thorough search, yet the results still confirm we have some work to do before we reach whole cultural diversity. For instance, with fewer songs from Kenya, we might be missing all those titles in Swahili that feature Nairobi – although we do have some in English.